Just after the resurrection of Jesus Christ, He revealed Himself to the Early Apostles__ when Jesus finished His last words to them, He ascended into heaven. Now I will not deal with the ascension, I will write about what the angels told the disciples just after ascension. Acts 1:9-11 (Now when He had spoken these things, while they watched, He was taken up, and a cloud received Him out of their sight 10 And while they looked steadfastly toward heaven as He went up, behold two men stood by them in white apparel 11 Who also said, “Men of Galilee, why do you stand gazing up into heaven? This same Jesus, who was taken up from you into heaven will so come in like manner as you saw Him go into heaven”. There are so many verses in the bible that talks about the return of Jesus Christ--- this is one of those verses. Years have come and passed and in the eyes of so many people it looks as if nothing is happening__ but I got good news for you dear friend “Jesus is about to come” My pastor will always say that a wise Christian is the one who has the bible in a hand and has the newspaper on the other hand__ he studies the bible to know prophecies but reads the newspaper to know when the prophecies are fulfilled. 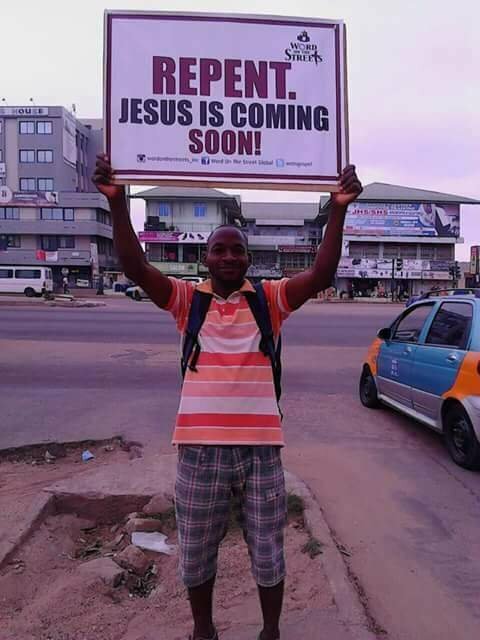 Although Jesus never told us the exact time of His return but He gave signs that indicates that His return is close ( matt 24). I’ve studied some of those verses and realized that most of those prophecies are fulfilled. In this season dear friends, l advise us to be aware and alert of this present time and season. The signs are fulfilling at a fast rate. Christians whose eyes are opened are aware that the return of Jesus is very close. I'll continue with this on my posts to come. e Jesus. We're living in a Critical time and season when prophecies are fulfilling on a weekly basis and it seems as if we're not aware of it. Keep living for Jesus, be fervent in the spirit. Do not be carried away. I hope to see you in heaven.